A SIMPLE GESTURE- RESTON is a food collection program that provides non-perishable food to support our neighbors in Northern Virginia. We do not store or distribute any food, but take it directly to the pantries on the days that the food is collected. We manage a large group of volunteer donors and volunteer drivers who make it easy for our friends and neighbors to support the neediest and hungriest in our communities. How Does A Simple Gesture Work? A Simple Gesture is a door-to-door food collection program. Sign up on this website! About 10 days before pick-up we will send you an email reminding you to place the bag outside your door on the appointed date. We will send another email reminder 1-2 days before the pick-up. Place your bag outside your front door by 8:30 am, and we will come by in the morning, pick up the bag, and leave another cool, green bag in its place. Your bag will be taken that same day to the Pantry. You can also volunteer to be a driver and pick up the food once every other month. It only takes a few hours and you can take your children to help. If you are interested in driving, note that on the sign up form! 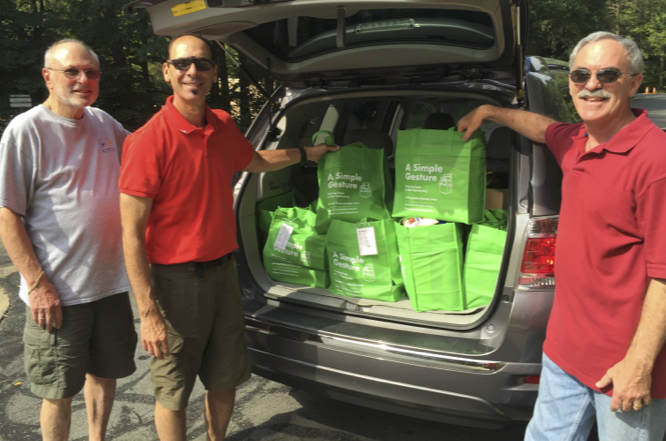 After the drivers pick up the cool, green bags of food, they deliver them to Cornerstones’ Reston Food Pantry. There, pantry volunteers empty the bags, sort the food and load up the empty shelves, ready to help those in need. How Did A Simple Gesture Start? To provide a regular supply of food to their hungry neighbors. To create new neighborhood connections and strengthen their community. To serve as a model for other communities. The Simple Gesture model spread to other communities, including one in Northern California, featured in an article from the November 30, 2014, Wall Street Journal. With the Journal article in hand, Bob Schnapp alerted members of the Shoreshim of Reston congregation about this project. And so, “A Simple Gesture” in Reston was born. Along with 35 other communities across the country, our community collects food from Virginia neighbors in Reston, Herndon, Great Falls, Potomac Falls, Vienna, Ashburn, and Chantilly. The venture began in earnest in June 2015 as a social action project with just 21 donors, collecting 420 pounds of food. Over the next few months, neighbors were asked to join in. Because of the simple nature of the program, people began to sign up. With 15 volunteer drivers, the April 2016 pickup had 161 donors contributing 3,220 pounds of food. In just the first 12 months of the program, over 12,000 pounds of food has been provided to feed our hungry neighbors to help them get back on their feet. And the program is still growing! By the end of the second year, it had grown to have collected over 30 tons of food from more than 500 donors. In fact, Bob was a “Best of Reston” finalist for his work at starting and expanding the program. Here is a video which was shown at the “Best of Reston” awards ceremony on April 6, 2017, highlighting Bob’s efforts. Jonathan Trivers of A Simple Gesture operating in the greater Paradise, California area, who provided much needed support to start our efforts in Reston/Herndon. Leslie Isakoff of A Simple Gesture in Greensboro, North Carolina, for her support in automating our activities. How Can I Support A Simple Gesture – Reston? The best way to support is to participate! A Simple Gesture Reston’s fiscal sponsor is Shoreshim Reston, a registered 501(c)(3) not-for-profit organization. Donations of food and monetary support are tax deductible to the extent allowed by law. This statement does not constitute tax advice — donors should consult with their own tax advisor.